September 28, 2014 will go down in history for the Indian-American community. Never before has an Indian Prime Minister, or perhaps any foreign head of state, been greeted by a diaspora in the United States with such powerful fanfare as what I witnessed today for Narendra Modi in Madison Square Garden. The venue was electric with excitement, emotion, and pure joy. And when Modi stepped up to bat, he did not disappoint. The crowd wanted a rock star, and they got one. He hit the ball out of the park: the speech was a home run, or a sixer depending on your point of view. Time and again, the applause from the sold-out crowd of 20,000+ was deafening. In international relations, and in particular in a US-India relationship that has often been fraught with disappointment, these moments are exceedingly rare. I am not given to hyperbole, and am very much a realist when it comes to problems. But it would be impossible for anyone in attendance at Madison Square Garden today not to feel the sense of POSSIBILITY: in India, in the Indian-American community, and in the US-India relationship. Miss America Nina Dhavuluri and PBS anchor Hari Sreenivasan were the MCs. The event kicked off with the usual song and dance numbers we come to see at diaspora weddings and festivals. 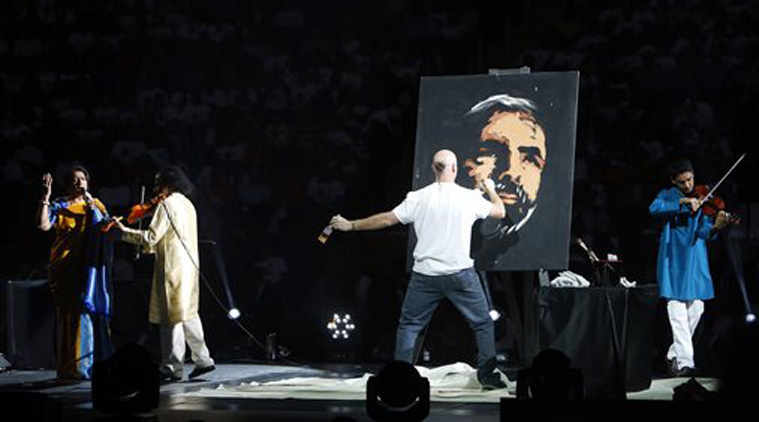 One act we do not usually see was a fantastic jugulbandi, or dueling violinists accompanying talented Indian classical singer Kavitha Krishnamurty, next to a skilled speed-painter who quickly and dramatically created a profile of Modi using paintbrushes in both hands to great applause. A number of VIPs were in attendance, including over 30 Congresspeople and Senators from both political parties, along with Indian-American Governor Nikki Haley. Chants of USA! USA! were shouted while they were being introduced on stage just before Modi’s arrival. When Modi finally came out on stage, things went up several notches. The roar from the crowd was nearly deafening. Something truly special was in the air. In India during the campaign season, many Indians may have experienced a similar feeling. But no crowd in America had ever been a part of the Modi madness till this moment. It’s hard to believe that for most of the last 10 years, Modi was not even allowed to visit America due to a visa ban by the US government. But that made the moment all the more special. One could see the love in Modi’s eyes for the crowd when he came out with his hands in the namaste gesture. He is a very natural speaker, and he talks confidently in a conversational tone. He can speak of serious things in a humorous and humble way. Every few lines drew thunderous applause. When you hear Modi talk about India’s unlimited potential to lead the world, he does not have an ounce of doubt, so absolute is his confidence in India (and himself). I was struck at the similarities to Obama when he arrived in office for the first time. 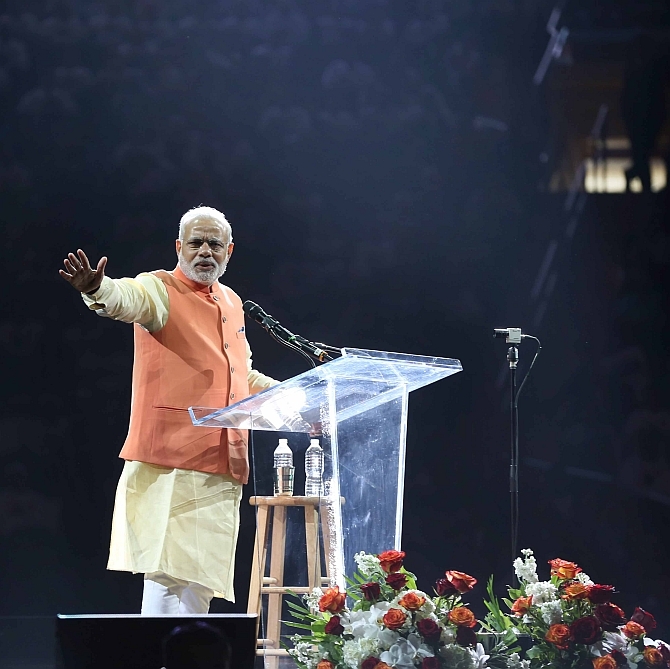 – Modi recounted a time when a Chinese interpreter asked him if India was a land of snake charmers. He responded that now Indians are playing with the mouse unlike our ancestors. – A theme Modi liked referring to was the three attributes that will make India’s rise happen: democracy, demographics (with 65% of the population under 35) and demand- the enormous size of India’s consumer base that dwarfs all others except China. – He discussed skill development, and how a skilled India can provide services to the entire world. – Modi said he will never stop doing big things for small people, as he is after all a small person. He spoke of “repaying the loan” the people of India have blessed him with, by producing for them. He also referred to loan repayment when it came to members of the diaspora helping their mother country. – Interestingly, Modi welcomed members of the diaspora to move back to India, as Gandhi did in January 1915 from South Africa. – In a tip of the hat to Martin Luther King, Jr. he said he has a dream that by 2022- India’s 75th anniversary of independence, all Indians will have a home. – The speech was not just platitudes. There were concrete steps discussed. Noteworthy initiatives included: merging the PIO and OCI consular schemes, allowing Americans to get a visa-on-arrival at Indian airports, cleaning of the Ganges River, and a reiteration of the government’s commitment to offering online services while eliminating the many useless laws in place. The event wasn’t perfect. The English subtitles screened on the Jumbotron for Modi’s Hindi speech were slow and full of mistakes. For some reason, the American national anthem was sung twice in a row, rather strange but benign. Protesters outside the venue on 7th Ave. savaged Modi for the 2002 riots in Gujurat. And Modi, during several minutes standing with over 30 prominent U.S. politicians, did not greet or shake hands with any of them (to be fair, he is meeting with most of them separately, but it would have been a nice sybolic gesture in front of the crowd). The event was most of all, a triumph for the Indian-American community, which often longs for home and to connect to its leader. The Indian American Community Foundation, a newly formed entity that drew on the partnership of 400 other diaspora organizations around the United States and Canada, pulled off a day it can be proud of. For years I have been waiting for a turning point in US-India relations. It’s too early to tell, but Modi’s current visit to the United States just may prove to be when the corner has been turned. He was treated as a rock star in Central Park at the Global Citizens Festival, where Hugh Jackman and Modi held hands above their heads. Modi also spoke to the UN General Assembly as a recognized world leader. There is no question that momentum is on Modi’s side. Can it continue? For now, the keyword is still possibility, not reality. More this week as we observe Obama’s meetings with Modi- and what policy ramifications come from it. Posted on September 29, 2014, in Politics/Diplomacy and tagged Modi Madison Square Garden, ModiinAmerica, US-India, US-India Relations. Bookmark the permalink. 1 Comment.